I have a new obsession and YOU ARE LOOKING AT IT. and it is all wrapped up in a huge soft flour tortilla and pan-fried until it’s crispy on the outside and gooey-delicious on the inside. The thing about a crunchwrap is that it doesn’t need to be bossy in the flavor department. I found the basic-taco-salad-ness of the flavors to be deliciously nostalgic and yummy, and besides, the main event here is the way it’s all structured. Its form. Its layers. Its texture. That is what will have you daydreaming at 3pm. The juicy drips, the gooey-ness, the crunch. Feels like peak humanity, tastes like sheer joy. Crunchwrap has become a verb in my life. “Should we Crunchwrap that?” is a real sentence that I say. I have Crunchwrapped sweet potato, black beans, taco meat, queso, Hot Cheetos (do it), tortilla chips, avocado, and more. I am proudly becoming a Crunchwrap Master. Anything you would put in a taco salad? Crunchwrap the heck outta that. We should probably pay tribute to the fact that the Crunchwrap is a Taco Bell thing, right? Okay, in all honesty, I’ve only eaten at Taco Bell once, and since it was past midnight, I don’t remember much, and really, isn’t that everyone’s Taco Bell experience? So in full disclosure, I’ve never eaten a true Taco Bell Crunchwrap which, it’s just, I know. I have a late night Bell run in my very near future. I’m more of a Taco John’s girl myself (Potato Oles all tha wayyyy) but today we need to focus on what really matters. You. Dinnertime. The Crunchwrap. 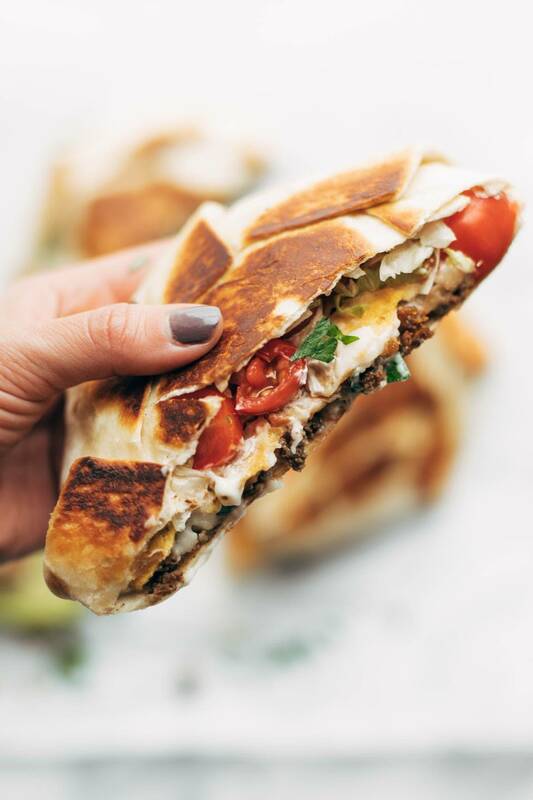 The drippy, cheesy, hangry-face Crunchwrap. Just like the Crunchwrap Supreme from Taco Bell – layers of taco meat, pepper jack queso, tostada, lettuce, tomato, sour cream, salsa, and hot sauce. SO YUM. Spicy Ground Beef: Heat the oil over medium heat in a large nonstick skillet. Add onion, garlic, and beef. Cook / break apart until the beef is browned all the way through. Add taco seasoning and salt. Queso: Melt the butter in a small saucepan. Add the flour and whisk until smooth. Let the flour cook for a minute or two, then slowly add in the milk, whisking after each addition. When the sauce is smooth, remove from heat. Stir in the cheese. Season to taste. Crunch Wrap Time: Lay a large tortilla on a flat surface. Layer: beef, queso, crunchy stuff, sour cream, salsa / hot sauce, tomato, lettuce, cilantro. Fold the edges of the tortilla in. Place in a hot oiled skillet. Cook for a few minutes on each side until the exterior is firm, crunchy, and golden brown. Cut and serve! I like a little mashed avocado and hot sauce on top. FOR REGULAR SIZE CRUNCHWRAPS: Keep your filling amounts minimal. It is very common to run into the issue of overflow, in which case, you can a) reduce filling amounts, b) fold it up as-is and hope for the best – I found even half-closed crunchwraps still grilled up nicely, c) break your tostadas into smaller pieces to allow you more space, or d) make a MEGA CRUNCHWRAP. See next note. FOR MEGA CRUNCHWRAPS: Cut a few of the large flour tortillas so they are the same size as your tostadas. Then, once you’ve layered all ingredients, just place a small flour cutout tortilla on top and fold edges over that. This should buy you a little extra space for filling. Mouth watering. I will definitely try it. This would be awesome in a lunchbox! All the lovely crunchiness of a quesadilla, but better contained! I’m right with you on Taco Bell – I think I’ve been once, maybe twice in my life. But we went to Taco John’s regularly when I was a kid, and we always got potato oles. Haha! I love crunchwraps and can’t wait to try these! Do they reheat very well? Do they maintain their crispiness or turn soft when you reheat? Thanks! Mine reheated well! It definitely lost some of the crunch but it was delicious and all of my coworkers were jealous. Hey Sommer! Because of the lettuce and the tostada, these don’t reheat super well. But if you do, we’d recommend frying it up in skillet again! I tried this recipe and I must it is one my favorite recipes of yours. OMG YESSSSSSSSS!!!! I just moved to England where there are no Taco Bell’s (sniffle) and crunchwrap supreme was my FAVORITE thing there and the thing I miss SO MUCH! You have me so excited about this!! Made these on the fly for dinner last night and I spent way too much time brainstorming all the items I could “crunchwrap” after we ate. Thank you!!! Glad you enjoyed it, Jess! I am very interested in this recipe, but just can’t visualize how to do the folding. Like others mentioned, would love to see a video, thanks! I found a Taco John’s (never been there) about 5 miles away…leaving now and tomorrow I’m grocery shopping and will be making this at home!!! Just found you today thanks to your link on southernplate.com…new subscriber to your blog now!! Hope you enjoy it, Susan! Wow, were these terrific! Thanks Lindsay! Hands down the BEST tacos I’ve ever had! My boyfriend didn’t think there good be anything better than a classic taco…then I mentioned cheese sauce hahaha I also found using a panini press alot easier than the frying pan, if you have one of those!! Thanks for the AMAZEBALLS recipe!! Glad to hear that, Sammi! Made this for dinner tonight. I definitely overfilled it but we made it work. It was delicious. Would you consider adding a Yummly button to your recipe posts? I use Yummly almost exclusively to make my grocery list and also as my recipe book when I’m cooking and would love an easy way to save these recipes there. Do you think these would freeze well?? And if so… Freeze before or after frying on the pan? Would be the perfect thing for when you’re starving and just need all the foods. Great question! I think it could work – my only concern would be the lettuce and the tostada, as they could get a little soggy. These were so dang good. I ran out of time and didn’t make the cheese sauce but just grated cheese and put it on top of the beef before the crunchy layer. Still really good. I can only imagine how good it’ll be when I make the cheese sauce to go with it! Any suggestions on how to replace the ground beef? I love the flavor of taco ground beef but the texture and taste of ground beef had me give up ground meat. So after having seen this recipe tease me over & over on the emails, blog, etc. I finally gave it a try on a whim. This was an even better version than the fast food original! I didn’t have pepperjack, so I made my own with 1/2 white cheddar, 1/2 Mexican blend and 1/2 can of mild green chiles. It was amazing & not as salty as the fast food version. I also made a vegetarian version with veggie crumbles & it was an easy & delicious mod. Thank you! this looks amazing. i actually don’t even like the taco bell crunchwrap that much (it isn’t my first choice) but whenever i see a copycat, i want it immediately. I always get these at taco bell, finding this i actually got very excited. Looks healthier, while still very flavorful. When you first posted this recipe, I knew that I would be making these. I finally got around to trying this tonight and it did not go as well as expected. My biggest problem was with the cheese sauce. It was way too thick. I saw that someone else commented with this same problem. Any idea why? I added milk to loosen it up a bit, but then the texture became grainy. In the end, we all liked the flavor, but not the texture. Any idea what might have gone wrong? Augh. DYING at how good these look!! !